To be honest I have never given the whole blue/black ink colour a lot of thought but Brad over at his Pen Addict website/podcast seems to be on a personal quest to find the best blue/black ink available. The ink I am about to review is one he has mentioned a lot. 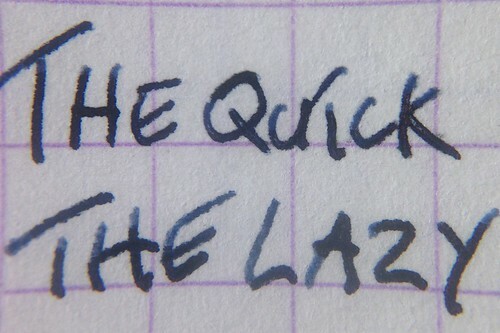 As this ink is essentially two colours it does make for interesting results as you write. One interesting aspect I have found is that it lays down almost towards a solid black colour but then drys into a wonderful deep blue. On closer inspection you will see light shades of blue mixed in with a deep blue that almost borders on black in some areas. 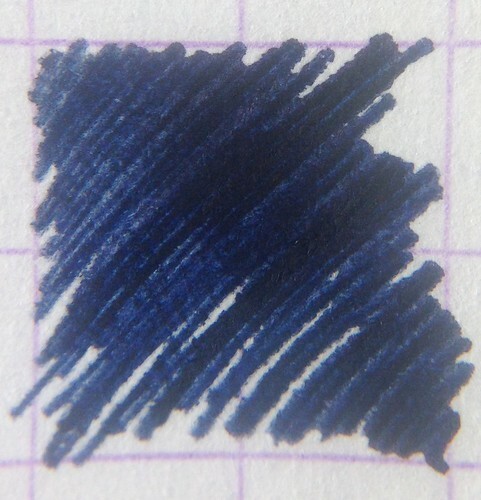 This makes the CP Deep Dark Blue have some very interesting tones of blue. Towards stage three of the shading test you end up with again that very dark blue bordering black. For me stage one provides the best tones. This lays down fairly wet so it requires a longer time to dry. As you can see even at the fifteen second mark it is smudging quiet a lot. This would make me think that it may not be suitable for left handed writers. If you are a lefty and have been using this ink I would love to hear from you! A breeze, a few flushes of water and it was all gone.